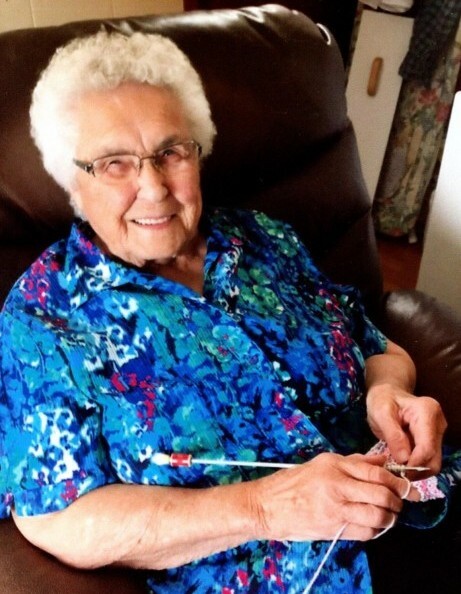 Elsie Irene Murray (nee Shobe) of Lintlaw, SK passed away on April 10, 2019 at the age of 97. Elsie was born on November 9, 1921 to John A. Shobe and Elise (nee Clark) on SE 34-35-10 W2. She married Robert Murray on November 22, 1939 in Lintlaw, SK. Elsie was a full-time wife and mother to their eight children. She was a member of the CWL and was always willing to help in her community when asked. She enjoyed gardening, knitting, puzzles, word searches, boat rides, cooking and her children, grandchildren and friends. Elsie is survived by her children Carole (Wayne) Bourget of Saskatoon, SK, Carrie (Gil) Murray of Sundre, AB, Bob Murray of Lintlaw, SK, Peter Murray of Lintlaw, SK, Brian (Verna) Murray of Sturgis, SK, Ken (Laura Olson) Murray of Lintlaw, SK; daughter-in-law Verna Murray of Kelvington, SK; son-in-law David Thomas of Saskatoon, SK; 18 grandchildren; 27 great grandchildren; 22 great great grandchildren and numerous nieces and nephews. She was predeceased by her husband Robert in April of 1996, son Malcolm in November of 1996, daughter Joan in February of 2012 as well as her parents, in-laws and all her siblings and their spouses.